Teacher teaches reading and writing too. Police officer helps us stay safe in all that we do. Dentists check whether your teeth are good. All these community helpers make our lives easier!!! 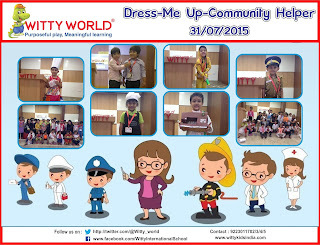 On Friday, 31st July, 2015, Witty World saw a parade of teachers, bakers, doctors, fire fighters and other community helpers, as Jr. KG children participated in a culminating activity for the theme of the week- Community Helpers. All the children were dressed up as their favourite and desired community helper. They were enthusiastic and confidently showcased their talents on stage. Each child either sang a song or spoke a few lines on their respective community helper and the others joined in. Children received cheers and encouragement from their fellow mates which boosted their confidence and helped those with stage fright overcome it. They thoroughly enjoyed using the child size Witty podium to enhance their presentation. It was role play at its best indeed! “To promote fluency in Spoken English” Story Telling Activity was conducted in WIS from July 20, 2015 onwards for Grade 1 to Grade 4 .Students narrated the stories, which not only improved their pronunciation but also imbibed positive values and attitudes depicted through various characters in the stories. Students also had an opportunity to reflect on the role of the story teller and the enormous power inherent in the process of storytelling. One of the most interesting concepts to teach a child is shapes. We see different shapes in our day to day life. 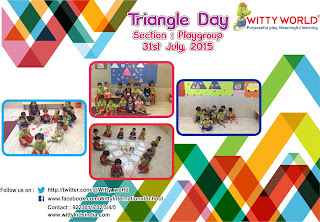 The little Wittians of Playgroup celebrated Triangle Day on Friday, 31st July, 2015. Teacher explained the triangle shape with the help of a story, and also showed different triangle shaped objects, and sang rhymes related to it. The tiny tots brought triangle shaped parathas, sandwiches and other food items in their lunch box, making the learning experience a sensorial one.The gross motor activity of walking on a triangle shape made on the floor with silver tape , further reinforced the concept. 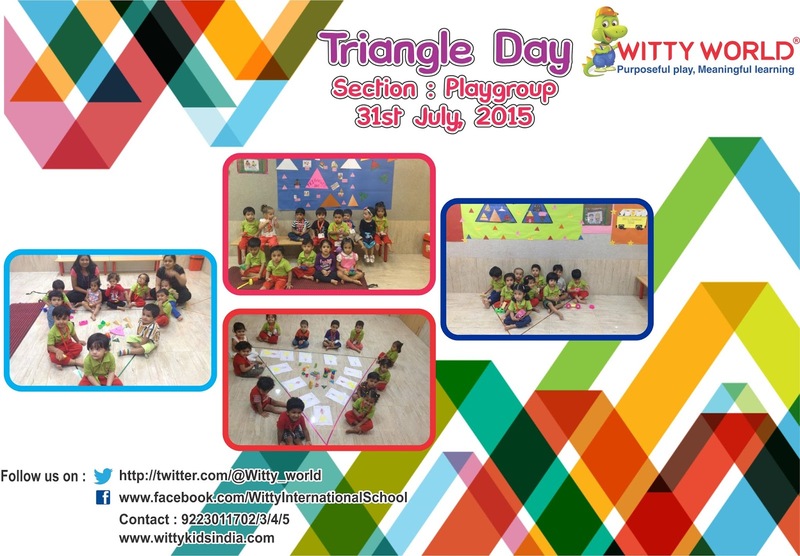 Triangle Day was indeed a fun-filled day of learning for the little Wittians!! The students of grade IV A & B of Witty International School, Sukher took great pride in conducting the special Assembly as it provided them with an opportunity to thank all the teachers. The assembly commenced with the harmonious performance of the prayer song. The students sang with sentiments and their emotions of respect and gratitude towards the teachers. The song was ensued by a thought and a poem. The thought echoed the age old tradition of paying respect to our gurus and that the guru was esteemed just next to God. Each presentation manifested the students deep admiration for the teachers. They conveyed their thoughts and feelings through an assortment of poems and speeches. The entire assembly resounded with approbation and veneration for the gurus. The assembly concluded with the students presenting a skit. The students thanked all the teachers for being the guides, mentors, friends and educators in their lives. Wittians Go Junky Today !! We all love to be refreshed from our mundane life. Then, how can kids be far behind. As the wittians of Jr.KG. are learning about the concept of community helpers, the next come in the line is the Bakers. 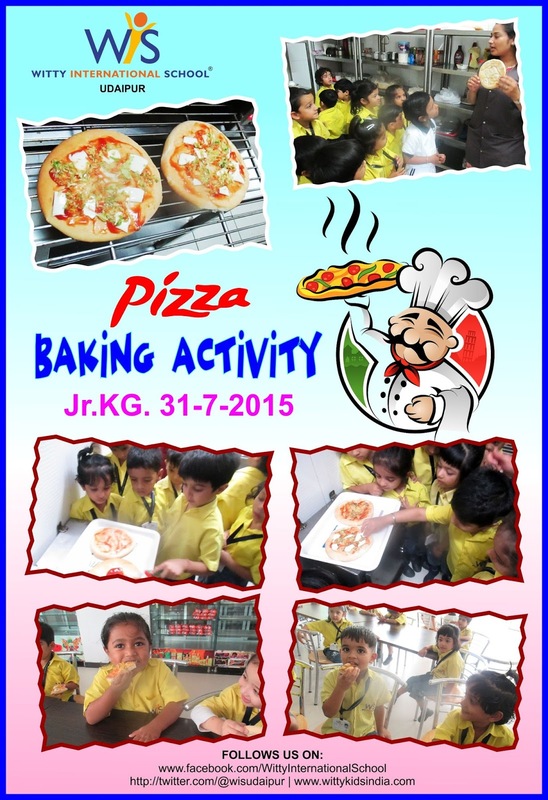 Today, the students of Jr.KG learnt about the process of making pizzas. The tiny fingers spread the pizza sauce, cheese and vegetables on pizza base. They learnt about the ingredients used & enjoyed its baking children relished eating it. And lots of letters, too. And they will write back soon. 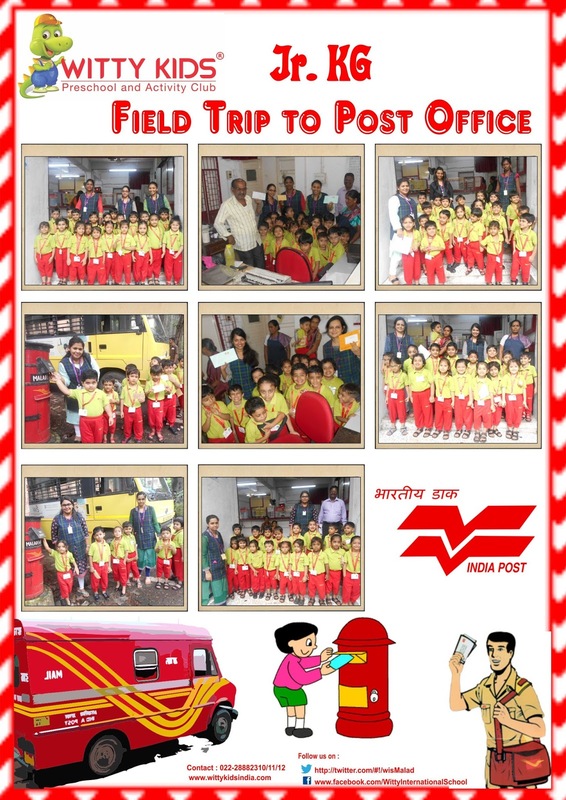 So on 30th of July 2015, Thursday, our Jr. KG Wittians along with their teachers went to meet one of the most important community helper – The Postman and the Mail carriers . Children were enthusiastic as they all had a special letter to post to their parents. It was a handon experience for the children to see how a post office works and how the postman goes about delivering the letters. The field trip came to a happy end with the children’s anticipating smiles about when their parents will receive their letters. Guru Purnima is an Indian festival dedicated to spiritual and academic teachers. This festival is traditionally celebrated by Hindus, Jains and Buddhists, to pay their respect to their teachers and express their gratitude. 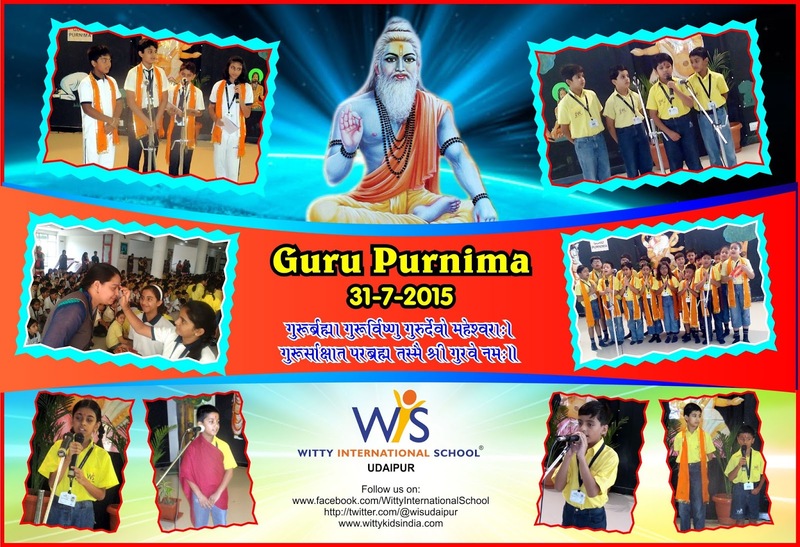 On this special occasion of Guru Purnima students of WIS, Bhilwara presented a wonderful special assembly for the teachers. They delivered heart touching speeches and songs to convey the message that Gurus are next to God and they take us away from the darkness of ignorance to the light of knowledge. Teachers were overwhelmed with the efforts made by the students. In this fast growing technological world, the life has become easy to govern with the types of machines that makes our work simpler. The students of Sr.KG. under the concept of “How things work” are learning about the different types of machines used in our day to day life. The learning has always become easy to understand with its practical implementation of the theoretical knowledge given. 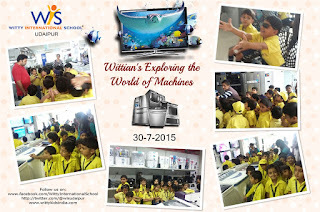 Witty as always with its ‘maxim learning is fun’ went for a field trip to the renowned electronics store, the Aravali Plaza. Here the students learnt about the different types of machines like washing machines, mobiles Refrigerator, T.V. music system etc. students learnt about the mechanism of these machines and enjoyed it. What better way to spend the day at school than creating your own magic recipe of making chocolate! Sr.kg students had a fun session of preparing chocolate balls using desiccated coconut and chocolate syrup. The hands on cooking experience was not only a fun sensorial experience but gave them an insight into how things work which was the theme of the month. Collage is one of the central principles of art in this country. Collage is a technique of composing a work of art by passing on a single surface various materials not normally associated with one another, as newspaper clippings, parts of photographs etc. Today, as a session activity Collage Making Competition was held at WIS Bhilwara. Students of Grade IV to VIII participated with great enthusiasm in the competition. Different topics were given to the students of different grades like Solar system, Famous Indian personalities, Disneyland etc.Students expressed their ideas by using different colours and cut outs with relative captions and slogans. When I read a story, It has more than one part. And from the places I start. Help me retell the story to you. Students of Witty International School, Bhilwara (Grade I & II) participated in story telling competition held on Wednesday, 29th August, 2015. Students told moral value based stories that helped to motivate audiences to act. If there is righteousness in the heart, there will be beauty in character, if there is beauty in character, there will be harmony at home, when there is harmony at home, there will be order in the nation, when there is order in the nation there will be peace in the world". Such messages were conveyed by the students during the competitions. This competition gave the chance to such students also who have fear of stage and they also came up with many inspirational and motivational stories as they all know that participation is more important than the result. Blooming Wittians visit the Hair Salon. Snippity snip goes the hairdresser’s scissors. 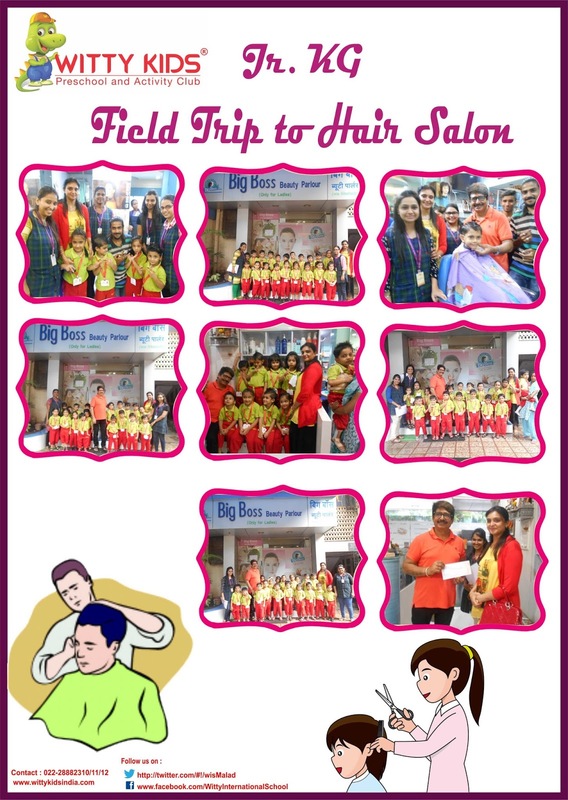 Hairdressing is a field that seems to emphasize people skills and the ability to work effectively in a group as well as in one-on-one situations. It is a field that provides more opportunity for creativity. Our hair plays an important role in our appearance. Your hair cut defines your face and personality, and a hairdresser’s job is to make our hair look good. A field trip is a great way to impact a child’s learning, it enhances their learning experience. 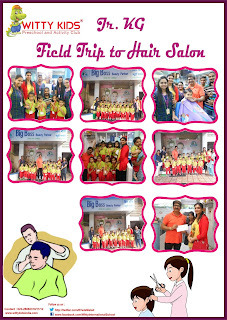 So our blooming Wittians of Jr.KG visited the Big Boss hair salon on 28th July, 2015 Tuesday. The hairdresser spoke to the children personally and explained them about their work. They showed the children the various tools they use in their profession. There was a surprise in store for the children as well! All the boys got spikes done in their hair, and the girls got a nice hairdo. The day finally came to an end and the children’s smiles spoke volumes about how happy they were with the trip.